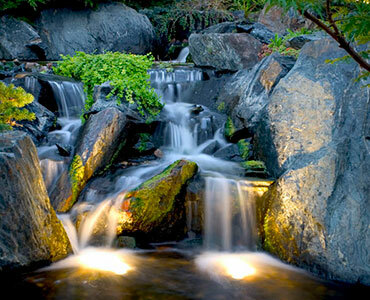 Landscape lighting design is more than just light fixtures. It is artful design and placement to create a dramatic look and feel. Picture soft moon lighting shining through a tree canopy and cascading soft light onto your patio, or up lighting a large maple or birch highlighting its colors and texture. Path lighting can guide guests safely around your property while showing the colors of smaller annuals and perennials. There are many different lighting techniques we can implement to create dramatic night time environments. 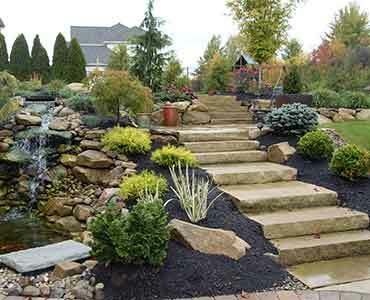 At Tim's Lawn Care Inc, we offer a full range of professional landscape design services. From your first phone call, our goal is to ensure that you receive the very best results that our service and expertise can provide. 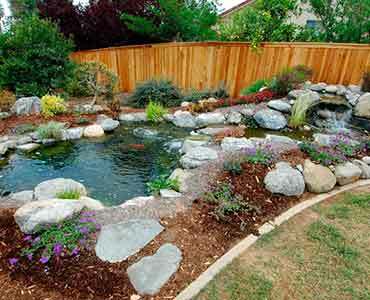 Pond design is divided into three categories: 1) Aesthetics, 2) Structual and Mechanical Integrity, 3) Proper Water Quality. To achieve the ponds full potential, all three aspects must be met in complete unity.Aesthetics: Designing the pond to look just as expected, Beautiful! Making sure the pond follows its given theme, natural or formal. This aspect of design is something a good pond installer can see before hand through precise visualization. 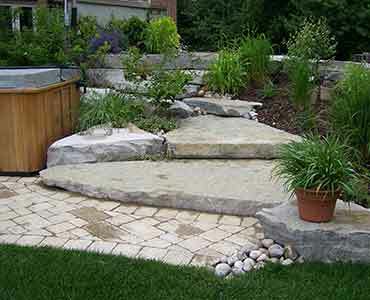 Pond & Landscape is proudly claiming the most attractive work. 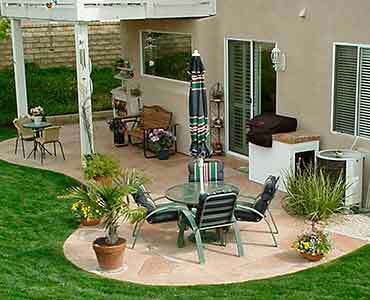 Our experienced design/sales staff will first meet with you on site to go over your ideas for the patio or walkway you want installed and all the details that you want to incorporate into your overall plan. Your salesman will then design you a detailed scaled drawing. We will work with you on deciding on what products to use on your project that will fit your house and your budget. We always offer the most up to date products on the market so we can always give you the opportunity to have the most unique project. Weed management decisions vary according to plant life cycles, infestation size, environmental parameters and management objectives. Hand-pulling a perennial weed species such as Canada thistle or leafy spurge is a futile effort, but very effective for control of a biennial plant such as diffuse knapweed. Releasing biocontrol insects for control of dalmatian toadflax on a 500 acre property is wise, but relying on insects for controlling small patches on a 40 acre pasture is inefficient. Successful weed management. 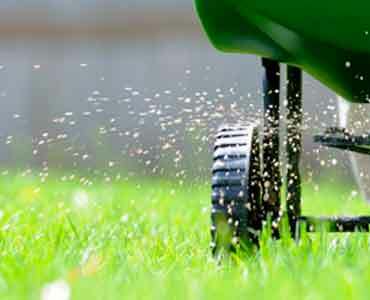 Not all lawn fertilization programs are created equal ! Many of the " department stores " and large national companies lawn care use and sell them fertilizer mixes large portions of the country. eachother using mixtures of fertilizers custom designed to work best with specific types of soil and grass mixtures in our area. 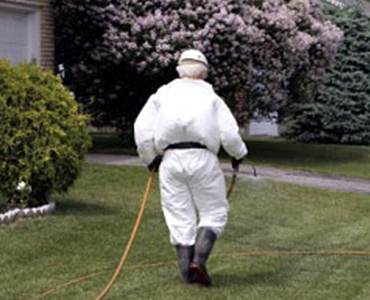 Our customized fertilizers , weed and pest controls are applied by experienced technicians and licensed to ensure the best possible results . All applications are applied using the latest equipment and techniques. 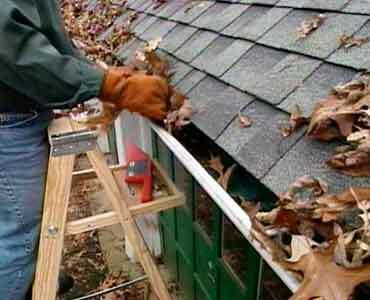 Gutter cleaning often takes a backseat to more pressing home repairs. 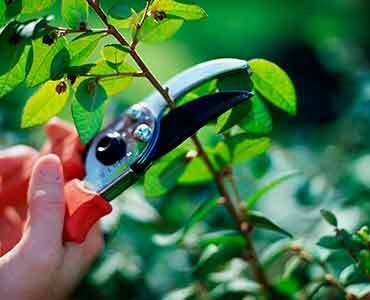 Unlike lawn cutting, this seasonal task is easily forgotten when patching drywall , installing countertops, or mowing the grass takes precedence. However, keeping rain gutters repaired and cleaned prevents many expensive, major home repairs from making your list.Prevent drywall repairs, fix roof leaks or repair water damage to soffits and fascia with expert gutter cleaning by Tim's Lawn Care Inc. 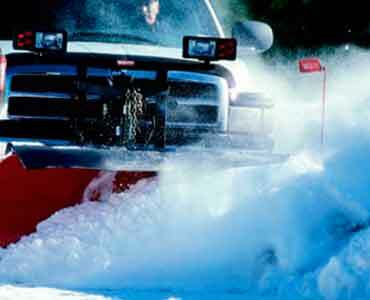 When your company needs the most professional snow removal, snow management, parking lot clearing, sidewalk clearing, salting, and other snow removal services, come to Tim's Lawn Care Inc., where we do it best because snow is all we do. 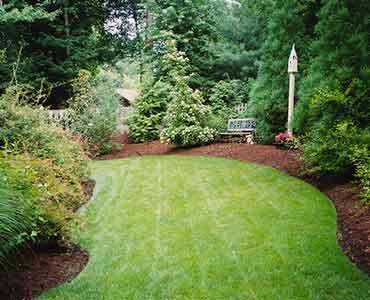 Tim's Lawn Care Inc, Tim's Lawn Care Inc is Maryland premier lawn care and Maryland landscaping company.